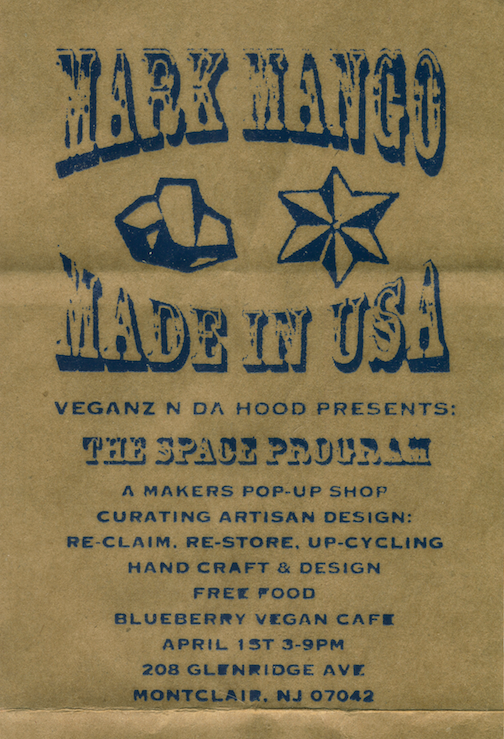 Space Program will have a complimentary vegan food bar powered by Blueberry Vegan Café with Chef Sean Hassan. Photo courtesy of Mark Mango. The Space Program, taking place on April 1, is a makers pop up show hosted by Mark Mango that will consist of artist and fashion designers. Mark Mango is the founder of Mark Mango Denim. He designs and creates his very own jeans, shirts and jackets. The Space Program event focuses on reclaiming, restoring and uplifting hand craft and design. Mango explained, “This is one of several pop up shows we do to give designers and artists the opportunity to connect to the public without large investments”. Mango further described that the Space Program will also allow for designers and artists to have access to the public market in an economically feasible way. Mango will be collaborating with Veganz N Da Hood, an animal friendly and product conscious company representing vegans. Veganz N Da Hood, located in Newark, NJ, focuses on environment sustainability, animal rights and lifestyles that are plant based. The Space Program Event will also consist of curating artisan design. Mango explains, “We put together an exhibit with design that has a less commercial approach and a more artisan approach”. The event will be held at 208 Glen Ridge Ave. in Montclair from 3-9 PM.